While I am familiar enough with the world of the classical guitar, and have earlier reviewed Mr Rupert Boyd’s previous collection of Fantasias on Serenade, I have heard cello music much less frequently and have never actually come across duets between these two instruments before. My first impression when beginning to listen to this collection of cello-guitar duets was the sheer richness of the aural texture. The cello, in the hands of an accomplished player, acquires a very human voice-like singing quality with a wide expressive palette. This, contrasted against the more harmonically staccato soundscape of the guitar, makes for a complete and variegated ensemble. This recording features the American cellist Ms Laura Metcalf with Mr Boyd and at the outset it is evident that the pairing works brilliantly. Boyd Meets Girl commences with the three-part Reflexoes No 6 by the Brazilian composer Jaime Zenamon. This is an inspired choice of music with its transitions between flowing arpeggiated chords and rhythmic passages on the guitar which allow the cello voice to flow effortlessly. The sombre first movement leads to the mystery of the second, in which the guitar initially leads over pizzicato cello passages and displays superb control over tempo and silences. The third movement is lively and propelled though the chordal modulation and melodic treatment even while the musical totality remains introspective, a quality that is well expressed by both instrumentalists. Allegretto Comodo by Radmes Gnattali is one of my favourite pieces on this collection, and was originally composed for cello and guitar. Under five minutes, a great variety of ideas are demonstrated most effectively, including pizzicato sections played on both instruments together, melodic passages on each in turn, significant harmonic modulation, and the unmistakable presence of Brazilian choro syncopation. Mr Boyd demonstrates his jazz-flavoured understanding of rhythmic expression here and the duo transitions effortlessly between exuberance and reflection. Gabriel Faure’s Pavane, originally written for the orchestra, has been presented here as a duet by Ms Metcalf and Mr Boyd. The unmistakably French character of the composition lends itself well to the lower registers of the cello, with the guitar accompaniment conveying the orchestral voices. The transcription is successful without a doubt, as is the interpretation. The duo have rearranged five of J S Bach’s Two-part Inventions by transferring the two hands of these keyboards pieces on their separate instruments. The result is delightful, as if Bach had intended these as duets in the first place. Ms Metcalf says, in the liner notes, that working on Bach interpretations was “….at once the most enlightening and the most maddening musical undertaking..”, but the ease with which the duo expresses these short compositions, clearly demonstrates their very natural and instinctive affinity for the baroque. Arafura Ariosa, by the Australian composer Ross Edwards, was derived from the second movement of his guitar concerto Arafura Dances by reducing the orchestral part to a single cello. This is exquisite music, made more so by the duo’s accomplished grasp of rubato and silence, and offers some very listenable textures. The contemplative and almost minimalist Spiegel im Spiegel, by Arvo Pärt, took some time to grow on me, as it requires equally contemplative surroundings to be heard with the right attention. The cello is played in the upper register here, with a very controlled and restricted vibrato, while the guitar part consists of an apparently simple and flowing series of arpeggios that would have sounded trite in the hands of a lesser player. However, the duo is at their best here again and brings the piece to life with ease. Café 1930 is the second movement of Astor Piazzola’s four-part Histoire du Tango, originally scored for flute and guitar. Piazzola had a key role in elevating the Tango from street music to an art form, losing none of the rich culture of the form in the process. By now, we expect the reinstrumented version with Ms Metcalf and Mr Boyd to capture every intended nuance and the duo does not disappoint in the least. Siete Canciones Populares Españolas by Manuel de Falla is a set of seven pieces for voice and piano, based on popular Spanish folk songs. The cello transcription of the voice is very effectively played and brings across the episodic character of each song, in keeping with the brief description of their background stories in the liner notes. It is interesting to consider that the piano parts would have been written by de Falla in the style of the guitar and that they have come full circle here to be played on the guitar. I was fascinated by Mr Boyd’s interpretative approach here which confidently balances a hint of flamenco feeling with a more formal classical reading. Finally, for us guitar players, Boyd Meets Girl offers an essential sonic stepping stone from our usually restricted solo instrument and repertoire preoccupations. The world of classical music is vast and listening to music such as this, is necessary. Fortunately, the duo also tours frequently and it would be very rewarding to hear them live. I remain ambivalent about the final piece on the album: the duo’s rearrangement of Michael Jackson’s Human Nature from his iconic album Thriller. It may take me several more listenings to decide whether this marks a new and exciting route for music or represents a dead end of sorts – especially if I go back to hear the original song. The duo version is actually rhythmically more interesting, helped by Mr Boyd’s tremendous command of timing and accenting and braced by the cello transcription of the synthesiser accompaniment. I am not so sure of the consequences of transferring the voice part on to the cello however: it works well enough most of the time, but I am compelled to question some of the ornamentation. The guitar section, on the other hand, has been prepared very effectively. Perhaps it will take more time for the duo to evolve these ideas, even if the overall direction is worth following up. To sum up, I would say that this album is an important collectible for listeners of classical music in our times and demonstrates the seamless transition across categories most convincingly – guitar and cello music, from the baroque to the modern and across cultures. I have to commend both Ms Metcalf and Mr Boyd for being willing to take musical risks by transcribing parts to entirely different instruments and performing the results with conviction and a very high level of instrumental command. They are not just interpreters and instrumentalists here, but are contributing to a significant extension and revitalisation of the repertoire for the future. The liner notes, too, are very readable and offer a personalised insight into the choice of repertoire and its preparation. Finally, for us guitar players, Boyd Meets Girl offers an essential sonic stepping stone from our usually restricted solo instrument and repertoire preoccupations. The world of classical music is vast and listening to music such as this, is necessary. Fortunately, the duo also tours frequently and it would be very rewarding to hear them live. Their website has more information on their concerts and recordings. 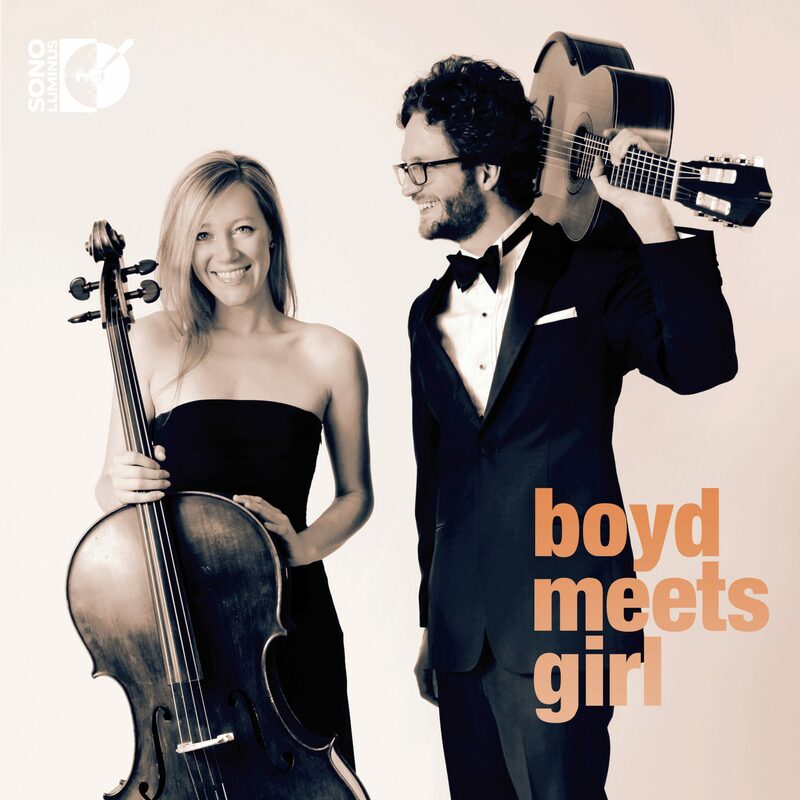 Boyd Meets Girl is available on iTunes and other major portals.